Left to right: Lucan Catel, 15, Piper Burke, 15, and Ellie Wade, 15, all Olympic High School, line up early for the show. 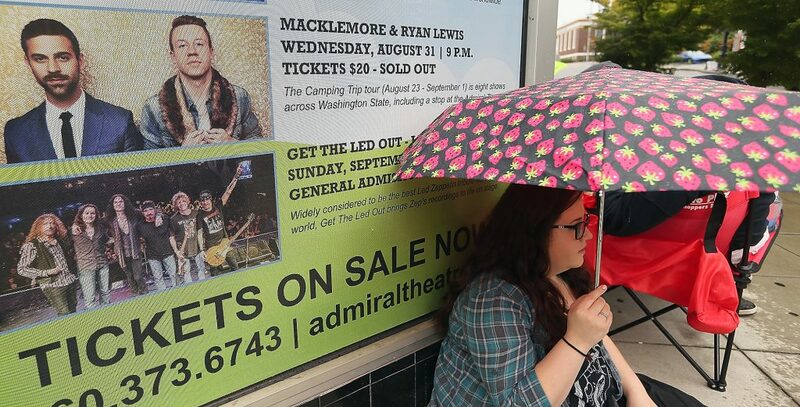 Macklemore’s Camping Trip tour has officially arrived in Bremerton. But some fans aren’t waiting for the doors to swing open at 8 p.m.; the diehards are already in line. Willow Hudson, 16, and Ashleigh Klemetson, 23, actually started the journey yesterday. The Seattleites boarded the 12:50 a.m. ferry to Bremerton and got some shut-eye in their car across the street from the iconic 1942-built venue. 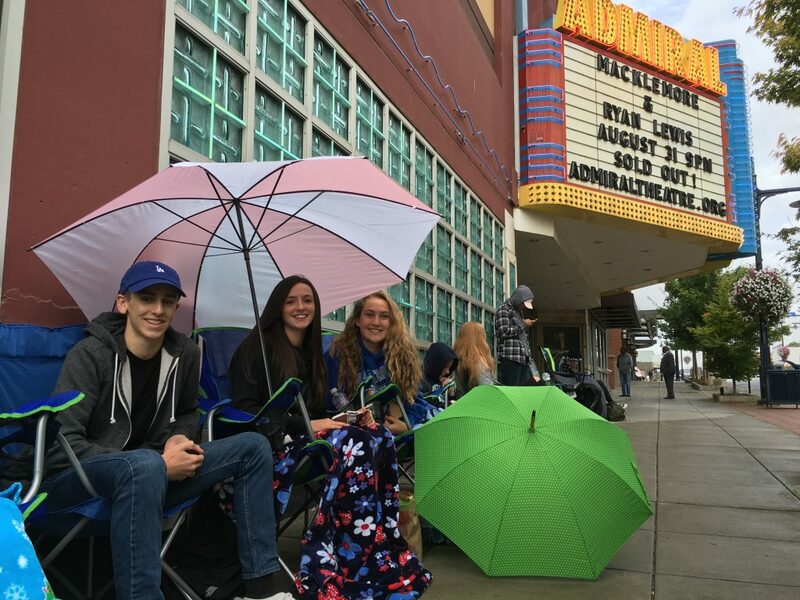 The two, who got in line just after 6 a.m., have seen several shows along the current eight-stop tour of small Washington theaters. Just down the line from them were three Olympic High School students. It’s the first concert ever for Lucan Catel, 15. “This whole tour is super awesome,” Catel said, noting the hip hop artist also known as Ben Haggerty is a “top three favorite” for him. He and classmates Ellie Wade and Piper Burke have just one problem: school starts tomorrow. That did not deter them from the show, however. “We’re gonna have bags under our eyes,” Burke said of Thursday’s first day. As of the morning, the line was a bit longer than one you might expect at El Balcon for lunch, but it’s expected to get a whole lot bigger. The theater holds 999 people, and it appears the line will snake down Fifth Street toward Park Avenue. The show is among the most highly anticipated in recent memory for the theater. Hometown favorites MxPx and Death Cab for Cutie also played there in recent years, drawing sell-outs as well. Tickets: If you were lucky and got them in the first hour they went on sale, you can pick them up at the box office. If not, this is about as sold out as a show gets. They can only be picked up day-of, in an effort by Macklemore and Co. to offer something special to fans (and not to scalpers). When to queue? That’s up to you, my friend. It is all general admission. The doors will open at 8 p.m. First of two openers is at 8:40 p.m. Macklemore and Ryan Lewis are due somewhere in the neighborhood of 10 and 10:30 p.m., and will play until about midnight. One thing to know: there’s not a bad seat in the house. The openers are Dave B. and Xperience (XP). Street closed: Pacific Avenue, between 6th and 5th streets, shut down about 10:30 a.m. and is closed through the entire concert. Food and drink: Lots of spots locally but the theater will have just concessions and drinks (both alcoholic and non-alcoholic). 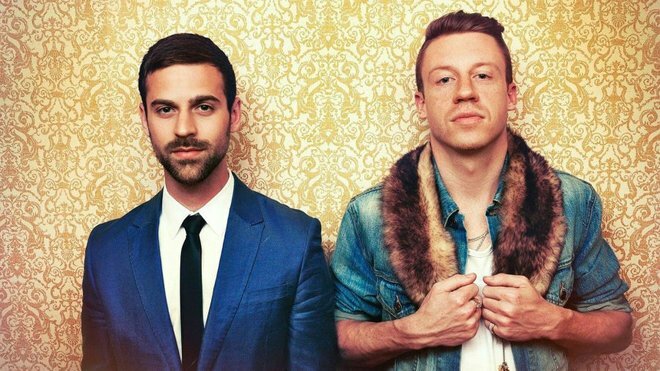 Macklemore and Ryan Lewis appearance outside: Word is the pair will appear in the late afternoon outside the theater, and sign a limited number of autographs for fans. T-shirts: The Camping Trip tour includes individualized t-shirts for each town they’re visiting, including Bremerton. They’ll sell for $30, more than the $20 tickets for the show, and while we all know you’ll get a better deal at a thrift shop, these are once-in-a-lifetime mementos. The Venue: The historic Admiral Theater opened in 1942. It’s currently raising money for a big remodel to occur on its 75th anniversary.